This class represents the concept of try statement within the try-catch support for exception handling in C++. Definition at line 208967 of file Cxx_Grammar.h. This pointer points to a SgBasicBlock containing the statements to be execued by the try block. 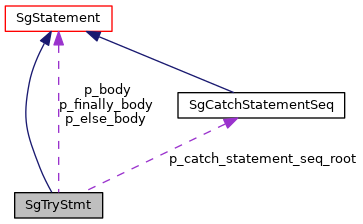 This pointer points to a SgCatchStatementSeq and connects the try statement to the sequence of catch statements within the support of exception handling. Cast function (from derived class to SgTryStmt pointer). This functions returns a SgTryStmt pointer for any input of a pointer to an object derived from a SgTryStmt. Returns valid pointer to SgTryStmt if input is derived from a SgLocatedNode. This pointer points to a SgBasicBlock containing the statements to be executed when control flows off the end of the try clause. This member is intended for use with Python, and is NULL otherwise. Definition at line 209474 of file Cxx_Grammar.h. This pointer points to a SgBasicBlock containing the statements to be executed when an unhandled exception occurs. This member is intended for use with Python, and is NULL otherwise. Definition at line 209478 of file Cxx_Grammar.h.